Getting married is exciting and magical. But, let’s be honest, planning a wedding can also be an expensive and stressful experience with all those costs, tasks, and to-do lists leading up to the big day. 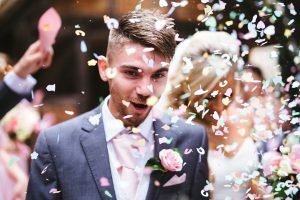 Making a number of DIY wedding decisions is a great way to go easy on the expenses, relieve a little wedding stress, and personalize your special day. It’s also a great way to include your friends and family, and have a little fun along the way. If you’re the crafty, creative type DIY wedding invitations and save the date cards are an excellent way to give a personal touch that won’t cost a fortune. There are endless ideas online when it comes to envelope liners, belly bands, unique accents, and the overall design. If you’re stuck for ideas, Pinterest is a goldmine of inspiration that is sure to get you started. Décor items such as marbled votives, wax paper backdrop, a wedding card box, and other reception focal points like gold dipped balloons and wire-wrapped signs are doable tasks that can be completed ahead of time. They are also a great way to express the personality of the happy couple and wow your guests with your mad skills. 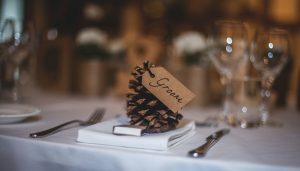 No matter what type of wedding décor you choose, we have an excellent selection of table linens, cloth napkins, place card stands, dinnerware, flatware, and glassware to help create the perfect tablescapes. 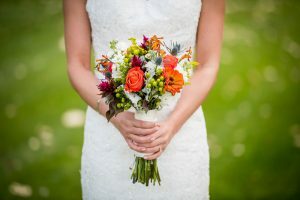 Wedding flowers can be one of the largest expenses on your big day. If you plan ahead and keep your ideas simple, creating your own arrangements can be a great way to save some money. For example, wrapping silk ribbon around flower stems will create a simple, yet elegant bouquet for both the bride and her bridesmaids. If you’d like to add more greens to your décor, it’s fairly easy to create romantic table runners, backdrops and chair decoration with olive branches, bay leaves, eucalyptus, and a few hearty blooms. Using greens not only costs less than full floral arrangements, but they also look and smell amazing winding down long tables. 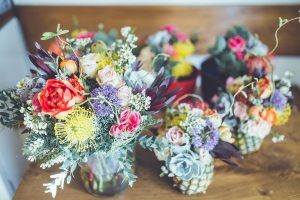 It’s easy to make a statement with mason jars filled with wildflowers, baby’s breath, or even a single flower. There’s the option of leaving the glass jars as is, or wrapping them with lace, ribbon, or a piece of string and a gift tag personalized with a quote or the initials of the bride and groom. Painted lanterns and vintage tea cups filled with succulents also make lovely floral displays. Once you choose your style, the possibilities are endless. This is one place where DIY food items can be a special addition to your day. As long as they can be prepared well in advance, sharing a secret family recipe, bottling your favourite beer or wine, or supplying your guests with jars of granny’s jelly are an intimate parting gift. If you’re handy with a blusher and a pro with mascara, doing your own wedding make-up will help you save a lot of money. Better yet, if you have a friend who’s talented with make-up, and volunteers their services, let yourself be pampered and cross it off the list. The celebratory wedding exit toss is an age-old wedding tradition that dates back to Roman times. While grains were once tossed to symbolize fertility, there are numerous modern options to make your exit a memorable one. A sparkler send-off is a dramatic way to exit in the dark. Custom paper airplanes make a fun kid-friendly send-off that is easy to create and economical. Or perhaps tie silk ribbons and wedding bells to the end of dowel rods for a twinkly exit. 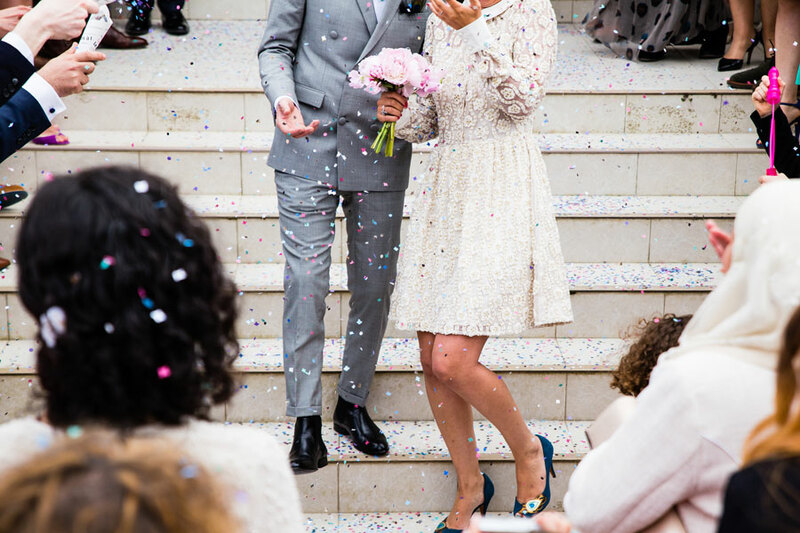 There’s also the option of filling paper cones with soft, inexpensive colourful pom poms, glittery gold paper confetti (easy to cut yourself or purchase), or flower petals. Whatever DIY wedding crafts you choose to tackle, don’t hesitate to get people involved along the way. Turn to your bridal squad for ideas and to lend a hand with wedding tasks. At the start of your wedding adventure, ask them to help out with things that they are both good at and passionate about. Some people love DIY crafts and others are better at researching and contacting vendors. While DIY wedding crafts can definitely save you money, they will take time to complete. It’s a good idea to avoid being overwhelmed and tackle only DIY projects you know you can handle. Things that are best left to the professionals are photography, food, music, and cake. From tents and arches to tables and chairs, we can help you with all your wedding rental needs. We have an extensive selection of event rentals, novelty items, and creative decorations to help you create lasting memories. We serve the Comox Valley, Campbell River, Powell River, Nanaimo, Parksville, Qualicum Beach, and everywhere in between. Give us a call at 250-871-4646, or email info@relayevents.ca to get a quote and book your rentals today. Or, if you prefer, stop by our showroom at 2-1255 McPhee Avenue in Courtenay. Here, you will always find our friendly and experienced team happy to help.